While welcomed in some quarters the NHS Long Term Plan has come in for a fair amount of criticism for its lack of strategic heft and poor focus on the relationship that the NHS must have with external partners such as local government and the voluntary and community sector. One of the areas where it does recognise the importance of making connections between communities, their assets and the voluntary sector is with regard to Social Prescribing. Social Prescribing has developed a fair amount of traction in the NHS. Indeed, the term itself speaks to front line health professionals such GPs, it uses their language and it has gathered around it some significant champions such as Dr Michael Dixon who was also the founding Chair of the NHS Alliance. I think this means that by 2023/4 900,000 people a year will be offered Social Prescribing by the NHS. Note the commitment to 1,000 social prescribing link workers. I have allocated them by population size of CCG so for example Sheffield get 10 and Corby 1 (my full CCG list is here) of course doing it this way takes no account of inequality. The statement about NHS Social Prescribing Link workers has generated anxiety in the voluntary sector who are the main providers currently – with concern that these will be NHS employees. At the moment there are about 59.7 million patients registered with GPs who make over 240 million appointments a year. compared to the 900,000 a year promised for Social Prescribing. This means that in 5 years time social prescribing activity will be equivalent to .38% of appointments at GPs. Here is an illustration of the scale of this. 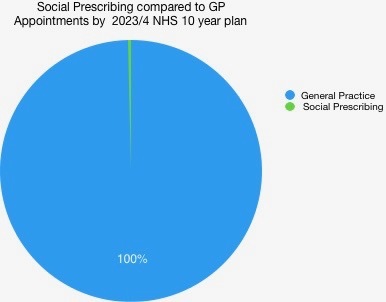 If you are an average patient and see your GP four times a year the odds of you being offered a Social Prescribing appointment are approximately once in every 60 years! Of course it is fairer to say that not everyone who sees a GP will need or want referral to social prescribing. It is probably more realistic to focus on people with multi morbidity. A recent study by the Department of Public Health and Primary Care at the University of Cambridge showed that over half of GP consultations are now with patients with multi-morbidity – this equates to 120m appointments a year. The pie chart below shows how the NHS England social prescribing commitment would impact on this challenge. It is clear that the current NHSE commitment still gets nowhere near – indeed it could be said that the NHSE response is so diluted and small that it will be almost homeopathic in terms of its system level effect! I mentioned in an earlier blog on Welfare Rights and Health that a joint paper produced by Citizens Advice and the Royal College of General Practice estimated that approximately 20% of GP time was spent with patients who presented with non clinical issues that would be better addressed elsewhere. I think that this proportion is likely to be much greater with when General Practice is providing a service to disadvantaged communities who are likely to have to higher levels of multi-morbidity and a greater level of non clinical issues. Finally there is a subsidiary point even a small target of just under a million people receiving social prescribing services will have a knock on effect to voluntary sector services. Some existing social prescribing services such as Rotherham have a degree of funding that recognises this. The NHSE 10 year plan does not seem to recognise this. The current ambition set out in the Long Term Plan leaves social prescribing as a bit of a sideshow for the next 5 years. There is a real risk that once the magical 900,000 a year target is met that the foot comes off the gas – with little having been achieved. Maybe this level of ambition matches need? Perhaps only 1% of people who see GPs require social prescribing? If it is only a minority interest then should more thought be given to ensure that this investment is reaching out to those who would benefit most rather than being generally available? Given the small scale of investment are there other interventions such as Local Area Coordination, Community Development and Health Trainers that might have a greater impact that should be considered by NHS England too? ← NHS Friends and Family Test Feedback – a distorted view? Mark, are you in danger of taking this “Long Term Plan” too seriously? Am I being too cynical in thinking the current Tory party, obsessed by Brexit and still committed to “austerity” and the steady dismantling of public provision and its replacement with private arrangements, has any other intention than kicking this complex and “wicked” question into the long grass? At least, there is some commitment to social prescribing within the long-term plan however pathetic it might be. I suppose the danger might be that CCGs take the number estimates as being what they should be providing rather than a minimum. Great article Mark, excellent presentation of the actual facts, I wonder who at NHSE thought this through before making such bold statements in the plan. I am a passionate advocate of SP but despair at this being showcased as something new! It may well have a recognisable label these days but anyone who has worked at community level in recent decades will scream from the hilltops with frustration. That said, I am still pleased to see it on the agenda and supported by Sir Michael Dixon and HRH Prince of Wales who attended the first SP conference held at the Kings Fund a couple of years ago. Until 2015, I worked at a national level within the NHS. Previously I was a CEO in the voluntary sector in Cheshire. My first role in the NHS was to undertake a review of all voluntary sector spending across central and eastern Cheshire. I collaborated with the local authorities in Cheshire at the time and the review revealed that between the PCT and the LA we were investing just on £6m a year in the sector but not telling anyone about the services. I banged on many a GPs door asking them to refer patients into the services the PCT and LA commissioned, alas to no avail. However, the goal posts have moved significantly since with some excellent models of SP working across the country, all have involved additional investment, with one in Halton (funded by Halton CCG) seeing a Care Coordinator from Wellbeing Enterprises sat at the MDT meetings within GP practices when a decision is taken to refer into the service. Whilst the medical model of health is to be acknowledged, respected and applauded, it is not always the answer a patient seeks. A person-centred approach to health reaps the greatest rewards. The conversation on SP is still in its infancy because without equal funding to support comprehensive role-out i fear it will become just another tick box exercise. I think it is important that social prescribing should not just become the latest flavour of the month and cause a loss of focus on good work already done by local authorities and the voluntary and community sector as well as wider engagement through programmes like MECC. We should be aiming to weave social prescribing into existing programmes and structures so that it genuinely adds value. I also have a professional interest in asking whether the new link workers will be regulated in any way. Excellent, thanks Mark. I’ve drawn attention to this locally (not sure it’s being seen as a leading issue in the Plan). About 2/3 of practices in Gateshead, where I worked last year, have some form of SP paid for by the practice, so for many the idea and value is not under debate, and I know many Health Care workers in Primary Care are working to resolve social issues, rather than working on purely ‘medical’ ones. I think it’s a bit naive to assume there is capacity within communities/Third Sector for activities to refer into – in more deprived areas in particular the prevalence of knitting groups and ballroom dancing sessions may be lower (!) and it’s likely this sort of referral will not resolve more complex issues (debt, social isolation, low level mental health issues). The challenge of approaching health more holistically and having a number of tools available depending on what that person needs (drugs, hospital, social contact, money to live on) continues. Although I broadly agree with the point that the current funding for social prescribing is unrelated to need, I am not convinced that your analysis of consultation rates is accurate. 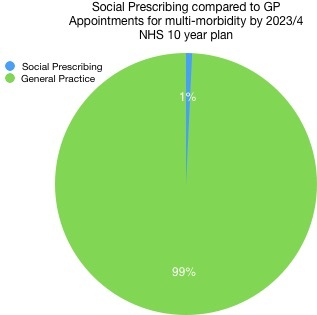 You are saying that ‘social prescribing activity will be equivalent to 0.38% of appointments at GPs’. You derive the figure by (900,000/240m)*100=0.38%. Doesn’t this calculation assume that each of the 900,000 people meet their GP once a year? This does not seem to account for the fact that most people who are supported by social prescribing are frequent attenders to their GP. So for example, social prescribing users in City and Hackney go to see their GPs eight times a year (median). If you calculate that over one year, 900,000*8= 7,200,000 so the impact would be more like 3% which looks very different from 0.38%, although perhaps still low. So perhaps your broad point is still valid but the magnitude is different. I also agree with your point about the proportion of people with social issues (rather than just clinical) being higher than 20%, in disadvantaged areas. It would be good to see a study that spells this out properly. And again, I agree with your point about Rotherham which is often talked about but much less imitated as it requires CCGs to fund VCSE delivery of support services. There are indeed other systems to fund this, for example, social impact bonds in Ways to Wellness (Newcastle) or community prescribing in Newham which followed an approach based on payment by result. All of these have advantages and disadvantages but I thought I would flag it up.